Jelle Bakker, who has a fondness for complex marble runs, made this epic 750-feet long sand track that descends some 125 feet from its start to its finish. 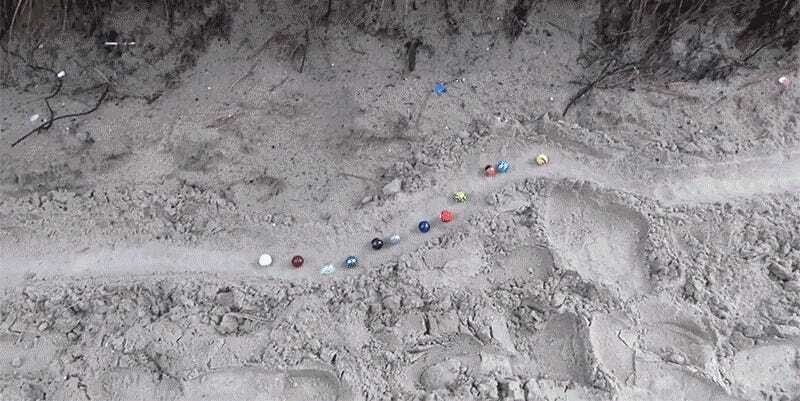 The 12 marbles competing in this video take almost four-and-a-half minutes to complete the run, and you’ll be surprised to find yourself rooting for your favorite. Are there organized marble racing leagues out there we don’t know about? If so, sign us up, because we’ve got a Cats Eye that we’re certain has what it takes to be a champ.